The first LMS of the RMN, KD Keris (111) during launch in Wuhan, China. Photo c/o RMN. The first Littoral Mission Ship (LMS) of the Royal Malaysian Navy (RMN) was launched on 15 April 2019 by the Chinese shipbuilder Wuchang Shipbuilding at Wuhan, China. The first ship of the class was named KD Keris (111), and was named in honor of an earlier ship class with the same name. Usually the name of the first ship of the class is carried over as the name of the entire ship class. The launch was said to be a record for the RMN, as the launching only came after 6 months since its keel laying, and is expected to undergo tests and sea trials prior to hand-over to the RMN. 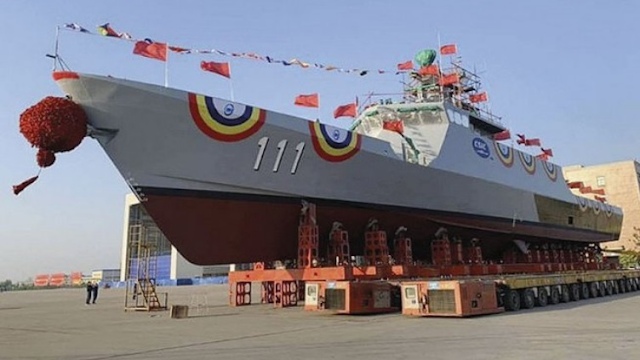 The Royal Malaysian Navy (RMN) ordered four Littoral Mission Ships from China Shipbuilding and Offshore International Co. Ltd. (CSOIC) based on a 69-meter long design. Originally the first two ships are to built in China by Wuchang Shipyard in Wuhan, while the remaining two ships will be built in Malaysia by Boustead Naval Shipyard. But changes made recently reduced the contract price from MYR1.17 billion (US$286.1 million) to MYR1.04 billion (US$256.8 million) but will have all four ships constructed by Wuchang Shipyard, and may also not include technology transfer. The RMN plans to acquire up to 18 units of the class as part of their 15-to-5 Fleet Modernization Plan. The Chinese-made LMS are 68.8 meters long, with a beam of 9 meters and draft of 2.8 meters. It displaces at 700 tons full load, and with a maximum speed of 22 knots and range of 2,000 nautical miles at 15 knots. It is armed with a 20mm or 30mm remote-controlled naval gun and two manually-operated 12.7mm heavy machine gun mounts. Further up-arming can be done but is currently not among the RMN’s urgent requirement.